The World Cup has changed a lot since its inception. Not the game itself (although rules have been tweaked over the years) but in particular the way we consume it. When the early football fans listened to the World Cup gathered around the radio, It would have been hard to imagine just how far things would have come in the hundred years or so since its birth. Fast forward to 2018 where we are streaming World Cup matches live around the globe, in 4K resolution, and even in virtual reality. As every World Cup passes, more and more fans are turning to streaming services than ever before, which is obviously putting a huge strain on the infrastructure that allows the web to function. The higher the definition of the stream, the more bandwidth that is needed to keep up, and with 4K now becoming standard in new TV sets, this weight is only going to get heavier and heavier. To give you an idea of the numbers we are talking about, a standard SD stream on a service such as Netflix is around 3Mb/s, with an HD stream topping out around 5Mb/s. When you get into the realms of 4K, you are going to be needing a bandwidth with a steady 25Mb/s stream if you don’t want to be seeing a drop in quality or that annoying buffering wheel. The BBC’s iPlayer is going further than that, and giving a recommended bandwidth level of a whopping 40Mb/s. Different services will have slightly different requirements due to the discrepancies in the encoding used for each service (for example Youtube has lower minimum requirements at the detriment of the quality), but overall these number form a pretty accurate template. 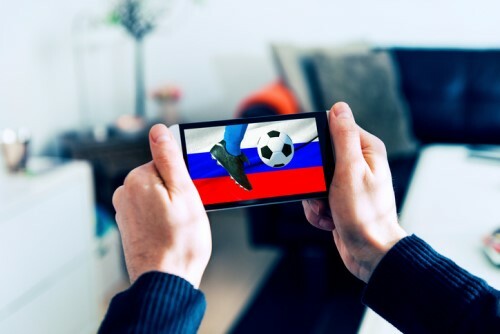 In general, the ISP’s have dealt with demand reasonably well, as well they should when armed with the knowledge that all their data provides, but that doesn’t mean that there haven't been problems for the consumer when streaming the World Cup. Location still dictates, but for how long? One of the biggest problems we may face when trying to watch the tournament is our physical location. If you happen to be out of your home country, gaining access to your usual terrestrial broadcasts is troublesome for those of us without a Slingbox or similar device. While you can circumvent these issues with the use of a VPN (or virtual private network) which routes your traffic through your country of choice, it does look as though content providers are slowly working towards a model where streaming rights are worldwide rather than cut up into individual territories. Not that you should expect this to happen anytime soon, but to imagine a future where these difficulties are still tangible, seems a little counterintuitive to say the least. Now, when it comes to sheer volume, our ISP’s will need to ‘gear up’ considerably in the coming years if we are to experience an interruption-free experience. Once those 4K streams becomes as popular as normal HD is now, we are going to be quadrupling our demand, and that is before you take into account a burgeoning population. To combat this, ISP’s will not only have to continue to roll out bigger pipes to our houses (with a particular emphasis on FTTP connections), but they will also be looking for a better eventual solution, and that solution is generally thought to be 5G. 5G, the quite obvious successor to 4G, is going to be a huge step up in mobile technology. With speeds of around 10 to 20 times what 4G can currently provide, 5G is shaping up to be far more capable than the current crop of broadband connections, and hence the reason many experts are looking at 5G as being the first nail in the coffin for fiber connections. This actually makes quite a lot of sense, and if this were to happen, it would be an especially good thing for those of us who like to watch a lot of sport, and here is why. Currently, most of us watch sport at home, and generally in front of the main screen in our house. It is true that more of us are streaming than ever before, but when we are on the move, streaming 90 minutes of the World Cup can really eat through your data allowance. With the advent of 5G, we could be in a situation where all of our home devices are connected through a 5G hub, or even through 5G connections directly to a provider. If the latter was to happen, we would be living in a world where data caps are a thing of the past, as your phone is simply classed as a device you pay for in your new ‘5G bill’. When that happens, coupled with either a move away from territory specific streaming rights or more widespread VPN use, we can literally watch the World Cup, Tour de France live stream or any other sporting event, anywhere we can get a signal. If this proves to be the case, big sporting events and their ilk will become even more of a strain on the infrastructure than they already. If data is no problem, you can bet your bottom dollar demand will increase, and when in does we can only hope our ISP’s are ready.